March 12, 2018 By Elise 1 Comment This post may contain affiliate links. Please read my disclosure policy for more info. 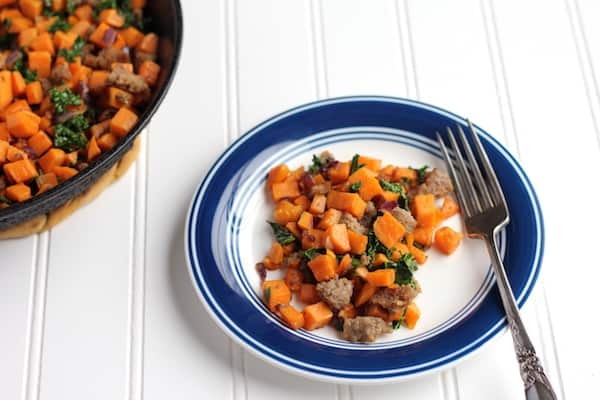 This colorful one-pan sweet potato hash recipe is surprisingly simple with only five flavorful ingredients that will tickle your taste buds! No, that’s not really quite right. I grew up on an Amish farm, right in the middle of a small Amish community. We were a tight-knit bunch, and did a lot of things together. Honestly, those things we did together were the highlights of my childhood. One of those “things” was hog processing. Everybody brought their pigs together, and we all worked together to process them. 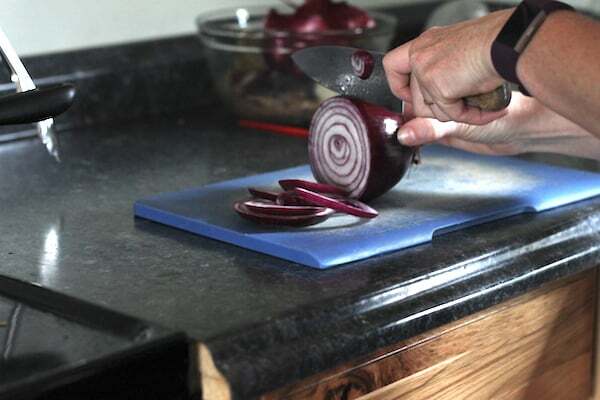 One of the things I remember most vividly is dicing fat with a sharp, but quickly dulling knife, handing that knife back in and getting a freshly sharpened one frequently. Several of us could easily spend an entire day dicing up the fat from 12-15 hogs, and that’s exactly what we did. Then the fat was taken out to a huge cast iron kettle hung over an open wood fire to be cooked down. I honestly don’t remember how many gallons the kettle held, or if it was all cooked in one batch, or two – or three. I suppose it probably varied from year to year, depending on how fat the hogs, and how many there were. But at the end of the two days it took to process all those hogs, we all took a pretty hefty bit of fresh lard home. There in the Amish community, we were free from the stigma around lard. In fact, it wasn’t until I was an adult that I first heard any negative claims about lard consumption, and that caused me to do a little research. Lard doesn’t smoke at high temperatures, and is flavorless, both of which make it ideal for recipes – especially for sautéing or roasting! All of those things make lard one of the healthiest fats for cooking, and one of my personal favorite things about lard is the way it makes food crispy, flaky, and light depending on the application, and I love making healthy dishes with lard. I’m so glad I grew up in an environment that gave lard the credit it deserves. It’s been a while since I was at a good old fashioned pig-butchering, and while we do raise our own hogs, our slaughterhouse doesn’t send back the lard, so these days I find myself buying lard most of the time. Our local Walmart carries Armor Premium All-Natural Lard in the baking aisle, and it’s a key ingredient in one of my favorite dishes – fried potatoes. 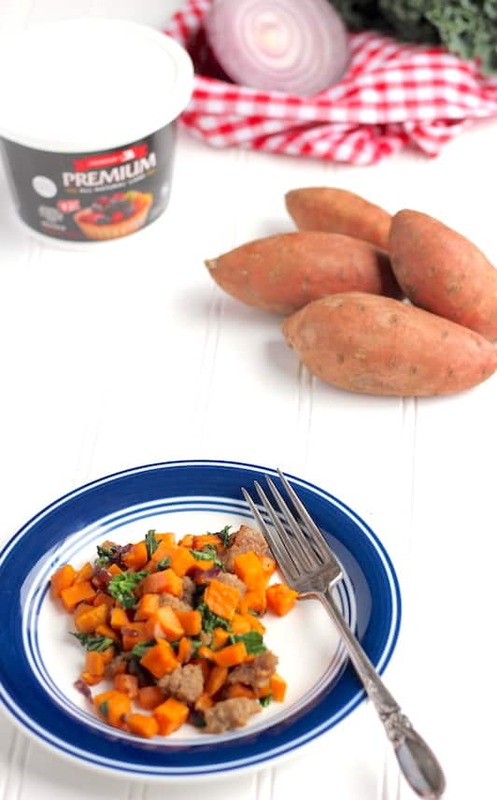 This particular recipe uses sweet potatoes to make a one-pan sweet potato hash that makes a great breakfast – or even dinner! – with no side dish required. 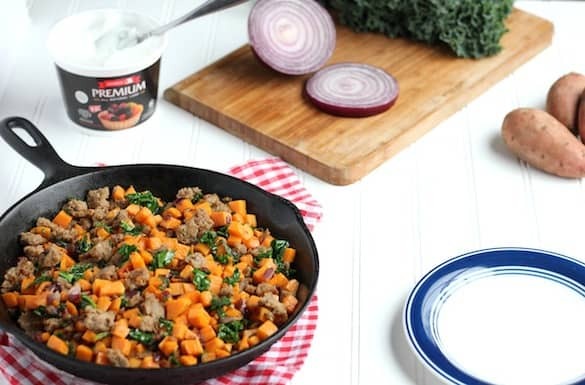 With ingredients like sweet potatoes, kale, and onions, it’s hard to imagine a healthier recipe to use with your healthy lard! P.S. BOTH of my kids like this dish – which is an accomplishment for any dish – even though they complain a little bit when they see the kale. Silly kids. Just because it’s green doesn’t mean it will kill you. This is very interesting! I didn’t know there was pure lard available at Walmart! I haven’t been able to find a brand without other ingredients. I am curious how their pigs are raised as I know that toxins often reside in the fat of animals. On the other hand, even if they aren’t raised “perfectly” I still believe natural lard is a step up from many of the terrible oils in the grocery store.